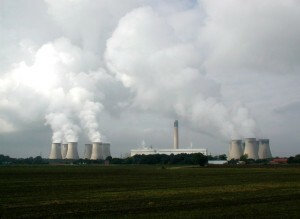 Water vapor and carbon dioxide aplenty at Drax Power Plant, Yorkshire, England, in 2007. 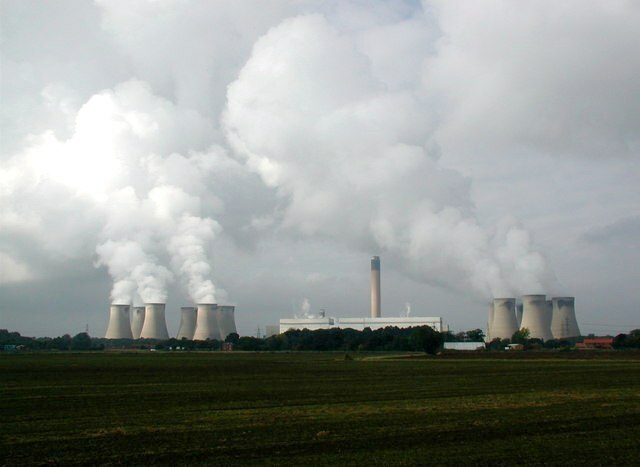 It has provided England with 7% of its energy needs, and is the biggest single emitter of CO2 in the country. A CO2 capture scheme was investigated but deemed too costly without major government subsidies. Photo by Paul Glazzard. August 27, 2017. A noteworthy moment in the history of the planet occurred with few of my countrymen noticing. On Friday, April 21, 2017, the United Kingdom got all its energy needs without burning an ounce of coal. Coal, as we know, is the most polluting of energy sources measured by carbon dioxide emissions—the greenhouse gas—and also soot, nitrous oxide and sulfur dioxide. The last three pollutants used to cause smoggy days, lung irritation, asthma attacks and even early death (see the great London smog of 1952, for instance; or Beijing’s current situation). That was before scrubbers were put on smokestacks beginning in the 1960s, and before sulfur dioxide trading began in the 1990s. Where did this incredible event I mentioned actually happen? 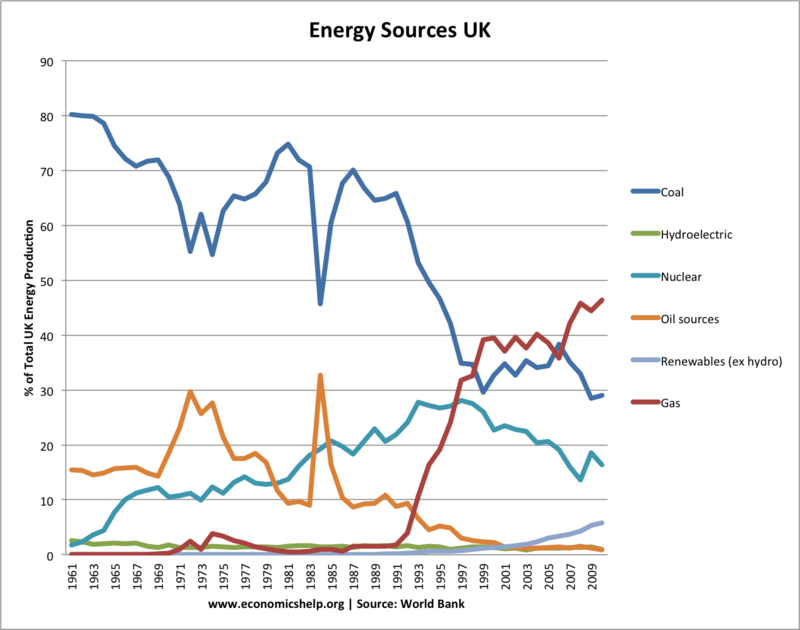 In the heart of the Industrial Revolution, Great Britain, which enthroned coal as the king of energy sources beginning in the early 1700s. Here we are, 300 years later, with a lot of water over the dam (which is a renewable resource, by the way, along with wind through the turbine blades and sun on the solar panels). In that time Britain threw its civilizing yoke on over half of humanity, becoming the most influential political entity the world had ever known until the United States took on that burden after WWII. We too depended on coal to drive our industrial engine, manufacturing objects to extend our civilization from thirteen little colonies on the eastern seaboard to the California coast. Not to mention fighting a civil war which killed more Americans that all our other wars combined, and the North winning it to abolish slavery and knock the landed southern aristocracy on its heels for a while, and along the way saving democracy from Germanic tyranny not once, but twice. We couldn’t have done any of this without coal. So coal, we loved you, we celebrated you, but like the lover who finally sees your toxicity to physical, if not mental health, we must bid you adieu. You were good to us for a time, but that time has passed. On that momentous day, April 21, 2017, we see the future. Germany is farther along than Great Britain, but Great Britain’s industrial class has less of a communitarian spirit than Germany’s and has resisted the wishes of Britain’s people to revoke coal’s kingly status and relegate it to a minor lordship for now, until the time when it dies a natural death. 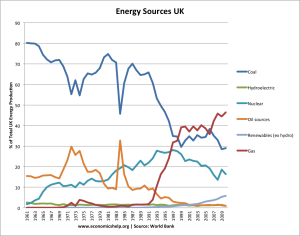 Coal’s decline in England mirrors the uptick in the use of natural gas since 1991. 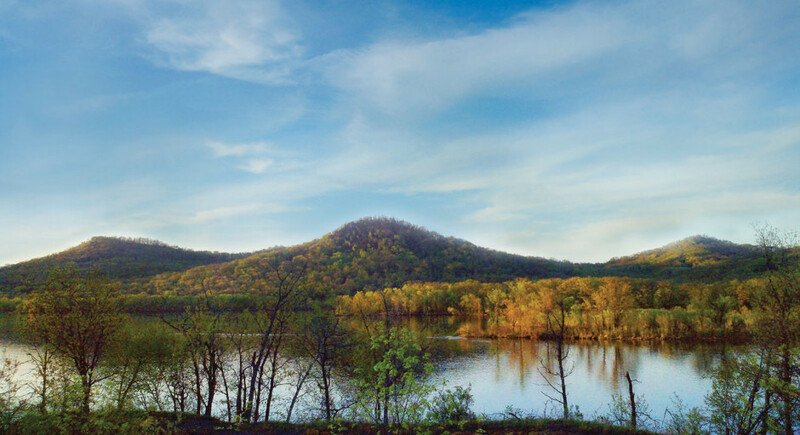 Energy conservation and renewables are adding to that trend. Source: “Economics Help” using World Bank data.